During the past few months, there has been some growing activity in the (hidden) French circles of the Haskell community. A few people, including myself, are trying to increase the interest around Haskell in the French-speaking communities. You may (or may not) have noticed the translation of Learn You A Haskell that is available here, in French. We also have an IRC channel, #haskell-fr (access it through Freenode’s webchat), and a mailing list. Please let us know about you if you are a French-speaking haskeller! But we would like to get it a step further. We are currently considering the idea of a French hackathon. We already have been offered a room for 3 days in June 2012, in conjunction with a French Perl event. So one of the reasons behind this blog post is to get some feedback about this, in addition to letting people know about the French community. Who would be interested in attending such an event? This would be in Strasbourg, France for the moment. Note that this would not necessarily be restricted to French haskellers! The format would be a pretty much classical Hackathon: potential talks and a lot of Haskell hacking. So please let us know if you’d be interested in attending this (by commenting this post, the IRC channel or the mailing list). 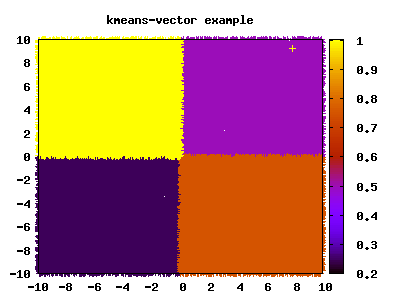 On a side note, these past few days, I updated one of my libraries: statistics-linreg and published one too: kmeans-vector. It performs the k-means clustering algorithm on a list of points, and can lead to “pretty” graphics like the following.